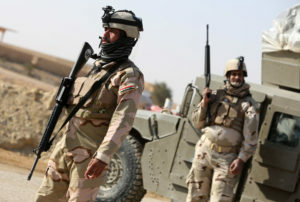 WASHINGTON — Violence continues to rise in the embattled country of Iraq, which has analysts scared of a possible civil war between Shi’a and Sunni Muslims. Reuters reported that at least 24 people were killed in a series of bombings in the capital city of Baghdad. Two explosions were near two Shi’a Muslim mosques and a third at a bus station. No one claimed responsibility, but in this year-long spike in sectarian and religious conflict, it is most likely due to Sunni and Shi’a tensions. Shi’a Muslims are targeted by Sunni Muslims and vice versa, as Sunni Islamist militants have overrun the country in recent weeks. The bus station attack occurred when a minibus, packed with explosives, blew up and killed at least 11 people. It was a busy bus station in the Shi’a district of Ur, in northern Baghdad. The other two attacks were in the mostly-Shi’a districts of Amil and Karrada in Baghdad, resulting in at least nine dead. In a separate attack, a car bomb killed four people in the city’s western district of Ghazaliya. The Iraqi government blames the al-Qaeda-affiliated groups operating in the region, primarily the Islamic State of Iraq and the Levant.